We had a weekend of Bridal Showers. It was so much fun. First shower was given by friends of her soon to be Mother-in-Law . Then Sunday afternoon was given by our side and the Bridal party. 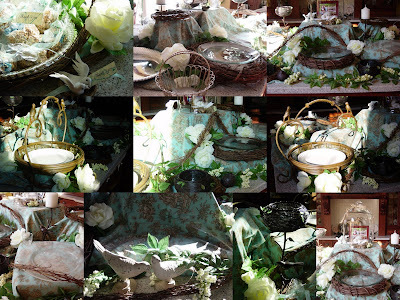 I practiced with the buffet decorations in my home using the lifts and levels. The shower will be at the maid of honor's home, but I will be setting up the buffet. I thought I would share the results. The bird theme really came together. Thanks for dropping by my blog! Love your background;) I've been blogging for a couple monthes and still can't figure out exactly how to change all the "looks" of my blog. Sounds like your showers will be a lot of fun. It looks just stunning! I love that brown and blue toile you used. It perfect!